136 pages | 20 B/W Illus. Ideas gain legitimacy as they are put to some practical use. A study of Charles Sanders Peirce (1839-1914) supports this pragmatism as a way of thinking about truth and meaning. Architecture has a strong pragmatic strand, not least as we think of building users, architecture as a practice, the practical demands of building, and utility. After all, Vitruvius placed firmness and delight in the company of utilitas amongst his demands on architecture. 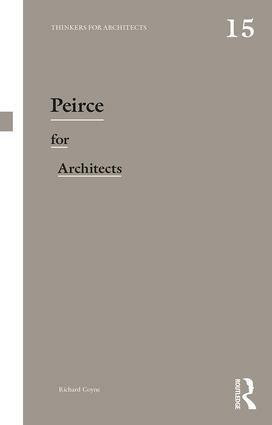 Peirce (pronounced 'purse') was a logician, and so many of his ideas are couched in terms of formal propositions and their limitations. His work appeals therefore to many architects grappling with the digital age, and references to his work cropped up in the Design Methods Movement that developed and grew from the 1950s. That movement sought to systematise the design process, contributing to the idea of the RIBA Plan of Work, computer-aided design, and various controversies about rendering the design process transparent and open to scrutiny. Richard Coyne is Professor of Architectural Computing in the Edinburgh School of Architecture and Landscape Architecture at the University of Edinburgh. He was formerly Head of the School of Arts, Culture and Environment. He inaugurated the MSc in Design and Digital Media, and is Programme Director of the MSc by Research in Digital Media and Culture. He researches and teaches in architectural theory, design theory and digital technologies, and is author of ten books that include Interpretation in Architecture: Design as a Way of Thinking (with Adrian Snodgrass, 2006), Derrida for Architects (2011), The Tuning of Place: Sociable Spaces and Pervasive Digital Media (2010) and Network Nature: The Place of Nature in the Digital Age (2018). Architects have often looked to thinkers in philosophy and theory to find design ideas or in search of a critical framework for practice. Yet architects, and students of architecture, can struggle to navigate thinkers’ writings. It can be daunting to approach original texts with little appreciation of their contexts. And existing introductions seldom explore architectural material in any detail. This original series offers clear, quick and accurate introductions to key thinkers who have written about architecture. Each book summarises what a thinker has to offer for architects. It locates their architectural thinking in the body of their work, introduces significant books and essays, helps decode terms and provides quick reference for further reading. If you find philosophical and theoretical writing about architecture difficult, or just don’t know where to begin, this series will be indispensable. Books in the Thinkers for Architects series come out of architecture. They pursue architectural modes of understanding, aiming to introduce a thinker to an architectural audience. Each author in the series – an architect or an architectural critic – has focussed on a selection of a thinker’s writings which they judge most relevant to designers and interpreters of architecture. Thinkers for Architects has proved highly successful, now with over ten volumes dealing with familiar cultural figures whose writings have influenced architectural designers, critics and commentators in distinctive and important ways. The series continues to expand, addressing an increasingly rich diversity of contemporary thinkers who have something to say to architects.